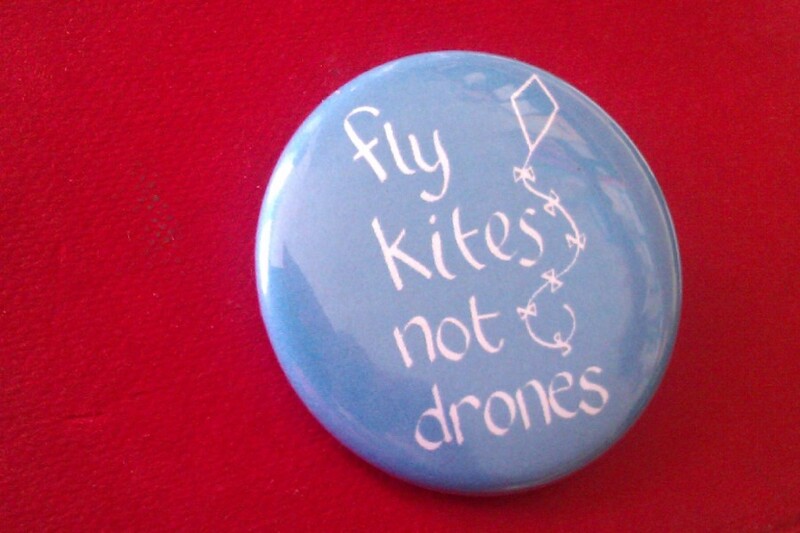 Please join us on March 21st (or around then) to fly kites in solidarity with children who live under the threat of weaponised drones. 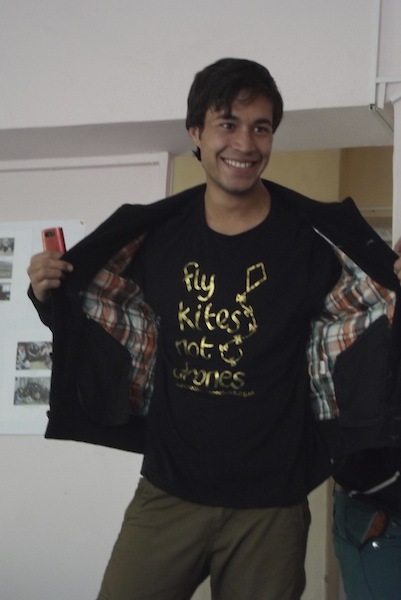 The campaign was launched by the Afghan Peace Volunteers in 2014, who told us that their younger brothers and sisters are now too afraid to fly kites because of the threat of drones. 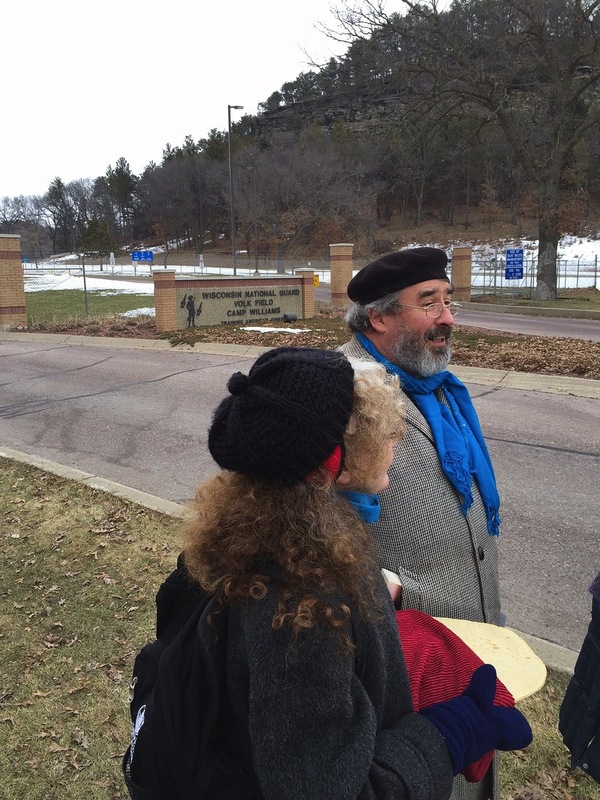 Camp Douglas, Wisconsin, February 23rd, two peace activists with Voices for Creative Nonviolence, were arrested when they attempted to deliver a loaf of bread and a letter to drone operators at Volk Field, an Air National Guard Base in Wisconsin, which trains pilots to operate Shadow Drones over other countries. Kathy Kelly and Brian Terrell carried the loaf of bread to signify the worth of relying on words rather than weapons. Watch the video and read the full report. 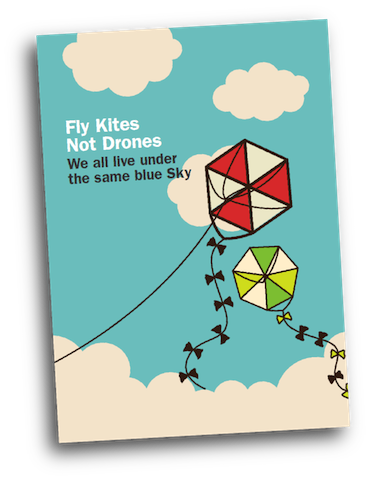 Order the education Pack £5 or Download it for FREE! Earlier this month Ellis Brooks & Maya Evans led 2 Fly Kites Not Drones workshop sessions with 13-15 year olds at Notre Dame Secondary School. 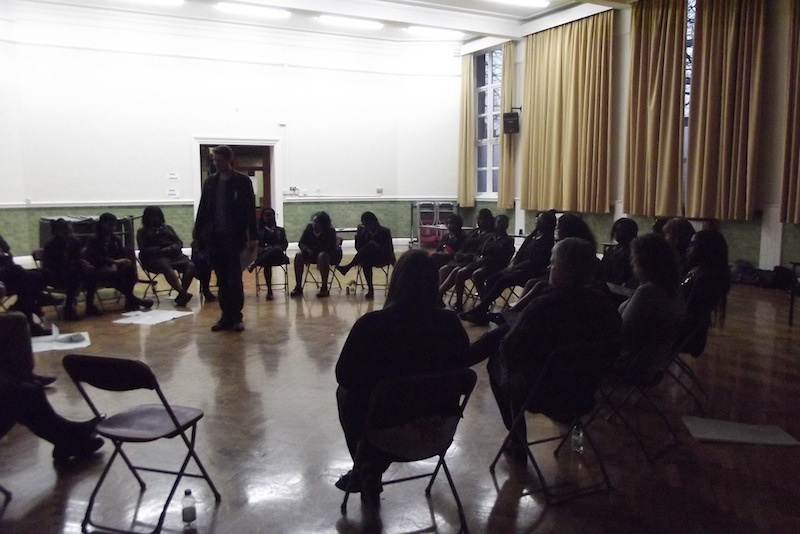 Pupils role played various characters from Barak Obama, to drone pilots and victims of drone strikes. There was hot debate and moving discussions. The pack also features on The Big Breakfast (35 mins in). A majority of the people in Okinawa, the most southern island in Japan, oppose the use of their island to host 32 U.S. military bases. Okinawa has become a major military and economic pillar for U.S. globalisation, with U.S. bases currently occupying 18.4% of the land in Okinawa. In other words, Okinawa, a prefecture which covers 0.6% of Japan’s national land area, hosts 74% of the U.S. military bases in Japan. 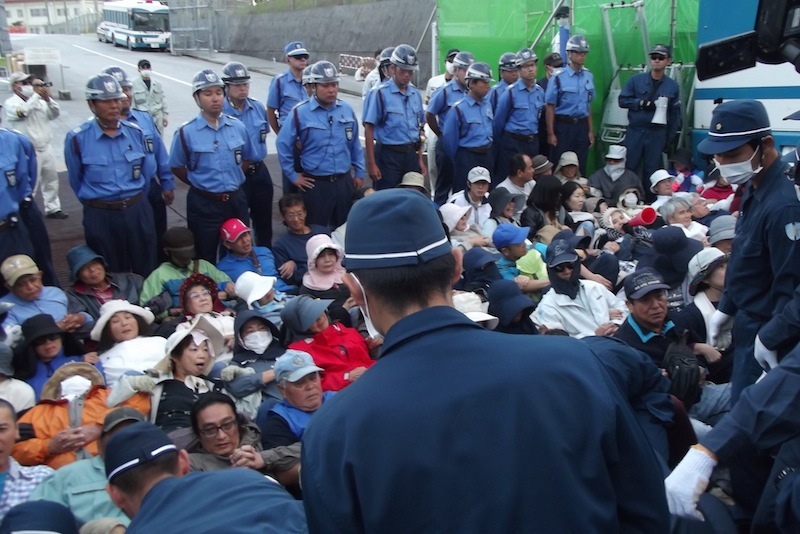 Every single day, Okinawans protest new construction of a U.S. military base. Their protests are echoed elsewhere in the region. 800 U.S. bases encircle the globe, today, with around 200 in East Asia. At the end of the second world war Okinawa was besieged by a turning point battle which killed 200,000 soldiers and local people. Between April and June 1945, during the ‘Battle of Okinawa,’ one fourth of the population died. Hillsides on Iejimia Island are said to be deformed due to the sheer bombardment of U.S. artillery fire from battle ships. The devastating defeat preceded mass land grabs by the U.S. and a catalogue of violent crimes against civilians. Sir Halford Mackinder, director of the London School of Economics, delivered a paper in January 1904: "The Geopolitical Pivot of History", arguing that the future of global power lay in controlling the vast landmass of "Euro-Asia", the "heartland", a "world island", 4,000 miles from the Persian Gulf to the Siberian Sea, so huge it could only be controlled via its "rimlands"- Eastern Europe, and the maritime "marginal" in the surrounding seas. Securing this area of land was something Hitler attempted in 1942. More recently John Darwin, a British scholar in Imperial History, noted in 'After Tamerlane', that the U.S. has achieved its "colossal Imperium … on an unprecedented scale." Following the second world war the U.S. became the first power in history to control the strategic axial points at both ends of "Euro-Asia". Using the threat of invasions by Russia, China and North Korea, especially during the cold war, the U.S. secured strongholds from Western Europe to Japan, using these axial points as anchors which encircled the world. In the Indian Ocean, Japanese destroyers and refueling ships helped U.S. and other militaries fight against Afghanistan. In Iraq, Japanese planes transported cargo and U.S. troops to Baghdad from Kuwait. The current conservative government wants to ram through a law that could lead to a revision of the Pacifist Constitution, already Japan's 241,000 member military is considered Asia's most sophisticated. In 2014 President Obama signed a Bilateral Agreement with the Afghan Government, the agreement gives the U.S. military certain privileges within Afghanistan, this includes access to nine major land and airbases, including the massive airfields at Bagram, Jalalabad and Kandahar, staging areas not only for air operations in Afghanistan, but the U.S. drone strikes that continue across the border in tribal Pakistan. Two months ago it was announced that the U.S. plan to use five military bases in Poland, mainly to host ballistic missiles. Meanwhile Germany has been accommodating a number of U.S. bases since the second world war. The Ramstein and Stuttgart bases have become essential communication hubs for drone operations across the Middle East and Africa, while in Buechel, the U.S. are keeping nuclear missiles. Without some of its 800 bases scattered across the globe, it would be impossible for the U.S. to launch its wars and flex its threatening international might, all of which have assisted the U.S. in gaining the position it currently holds in the world today. Today Okinawa hosts, what the Japanese Government describes as, "the most dangerous airport in the world" in the U.S. Futemna Air Station and over 26,000 U.S. military personnel, while also picking up the tab for most of the expenses generated from the 70 years of U.S. military occupation. Crystal clear waves lap upon the shores of the breathtakingly beautiful Oura Bay, a languid wave withdraws into the sea, the crushed shell sand suddenly comes to life as crabs leap up and scurry towards the beach. Now on the horizon, a line of bright red super-sized shipping buoys cuts across the bay, creating a formidable boundary, marking out the 120 hectares scheduled to be land filled for the new U.S. navy port and airfield. The endangered dugong (a manatee like creature) has left its critical feeding ground, rich in plankton from fresh water jungle tributaries leading into the unique bay. The Sea Turtles have also left. The future of rich coral biodiversity remains uncertain. If the landfill takes happens, 7,000 year old coral will be destroyed. Every day, citizens from across Okinawa block and protest the gates of Camp Schwab, representing the 77% of islanders who oppose construction. One activist says that life on the island is like "living in a colony". All eyes are currently on Japan. Will they keep their peace constitution and the massively respected Article 9, which promises to never wage war or persecute others? Will Japan follow the U.S., or stick to its principles and the lessons learnt from its recent troubled history. Every year the international peace movement remembers Hiroshima and Nagasaki, 140,000 people instantly vaporised, one of the worst atrocities in history. We now hold up the protests of Okinawa in the same way we hold up Hiroshima and Nagasaki. The future of Japan is precarious, and what unfolds in Okinawa is of paramount importance.